I've fixed all known xml2po bugs (at least all bugs reported in Bugzilla; I know of at least one other bug [look at TODO] which I only partially fixed :). But, this would be no good if I didn't actually start developing regression tests. I'm not planning on distributing them, but I've put them in CVS so anyone can look at them and try them. Since it's sometimes hard to come up with decent examples, I'd like to have a couple of more complex XML (preferably DocBook) files, which will push xml2po to it's limits. Of course, it's better if they're smaller, but I won't mind even large, very complex documents, but only if you provide me with a translated PO file as well (so I can test both extraction and merging). Why is my desktop always ugly? 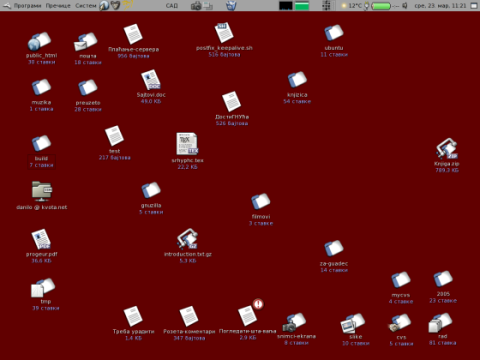 Davyd has asked how does everyone's desktop look like. Perhaps I don't look at it enough to mind, even though I have my $HOME on it? I've found some time to hack a bit more on my PO handling stuff: I've added PO file merging along with "inline-diffs", along with an example pomerge.py utility. As for diff-format, I've used what GNU wdiff seems to use to mark out changes (I'm getting redirection limits exceeded on these pages now, perhaps they're down; you can look at any of the mirrors, such as here). At the same time, this wouldn't be so useful if our PO editors didn't add some support for it: well, you can see that I have po-mode with syntax highligthing (and there's also a polite-mode which has nothing but syntax highlighting, thus is useful for testing). Emacs highlighting diffs for fuzzy matches. Now, why do we need this? Look at the examples above: our second diff clearly indicates that the only change for a matched message was removal of "\n" at the end of line. First diff shows that one word was removed, other was added, and newline was removed. And with all this, it's so much easier to see what needs to be changed in translation. Granted, with small messages such as those in the screenshot, this isn't very useful. But, when it comes to translating documentation (hint, hint: xml2po), this should be a very major help when someone fixes a typo or adds some interpunction or only a couple of words to a long paragraph. Now, with Python this was easy: who feels like working on something like this for GNU msgmerge? Btw, I wonder why is GUADEC 2005 not 6UADEC? Was it a decision by GVADEC and GU4DEC organisers to make them so? And Gnome Journal is seriously rocking! Go read it now! Marc: most of the problems with release notes translation are my fault. I didn't have much time to work on xml2po lately, and then I recently fixed one bug in it, and unknowingly broke behaviour for some uncommon constructs which appear in release notes. So, I went on and on with bug-fixing (instead of simply reverting to previous state—my goal was then not to break existing translations, but then there were many other fixes, so I should have done that right away instead). However, though I agree there were problems with release notes translation, I disagree on what they were. First of all, we need xml2po to be tested and stable, and that's going to happen only when we go through enough of our existing documentation with it: some of the things that many complained about are really trivial to fix, and are only related to the docbook mode of xml2po (which tries to make it a lot easier for translators to do their job). Next, this is our first attempt at release notes translation, so I didn't want to change directory layout to be suitable for gnome-doc-utils.make rules, which are already tested and working very well. Not to mention that gnome-doc-utils.make is using a switch to xml2po (-e) which would have hidden the bug in xml2po that release notes exposed, so if we had it, we would have not seen any problems using any of the recent gnome-doc-utils tarballs (0.1. *), so there would be no need for CVS HEAD. Finally, we want our documentation to show in status pages as well: I need to add support to intltool-update for gnome-doc-utils-style docs, because that's currently the simplest way to get it. As for your problems, there's always an updated release-notes.pot file in CVS, which you can msgmerge with if you're having problems working with xml2po: but this would also be solved with release notes showing up in translation status pages. PS. This was the notice about Dutch, Serbian, Italian and Norwegian translations being "dropped". Now, coincidentally (or not? ), I've had to work on a few of my l10n software pieces these days: PHP gettext I wrote in October 2003, and xml2po. And, with Gnome 2.10 fast approaching, I needed to do some hacking on xml2po in order to fix bugs in translating release notes. Also, there's a big new addition by Daniel Leidert is a man page for xml2po. There're some other interesting updates (like tag name being included in source references), so try gnome-doc-utils/xml2po CVS today! With all that, I have not yet started on Serbian Gnome 2.10 translations, but Igor promised help on evo part, so we should complete it once again in due time. Free software magazine in Serbian is out with it's third edition. It even got a new webpage. Feature topic is history of GNU and Linux (anticipating Linux' 11th anniversary), but it adds reviews of ProtOS (a Serbian GNU/Linux distribution), FreeBSD ports and packages, GNU/Linux for newbies, using iRiver, wxDesigner and an article on Perl programming.